Widely recognized as the definitive work in its field ever since its original publication in 1962, Serial Composition and Atonality remains an unsurpassed introduction to the technical features of what is probably the most revolutionary body of work since the beginnings of polyphony. In the analysis of specific compositions there is first and last of all a concern with the musical surface—an attempt to trace connections and distinctions there before offering any deeper-level constructions, and to offer none where their effects are not obvious on more immediate levels of musical experience. 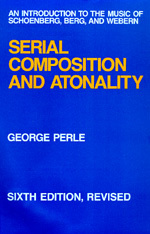 In this sixth edition of the book, George Perle employs the new and more consistent terminology for the identification of transpositional levels of twelve-tone sets that he first proposed in Twelve-Tone Tonality (1977). George Perle, one of this country's most respected composers, theorists, and critics, is the winner of the Pulitzer Prize in music and a MacArthur Foundation Fellowship. His writings on twentieth-century music include The Listening Composer (1990), The Operas of Alban Berg (1980, 1984), and Twelve-Tone Tonality (1977), all available from the University of California Press.